Picture yourself on a luxurious train, traveling back in time to a far distant land, weaving through rural towns flanked by vast rice paddies and lush jungles, working your way through some of Southeast Asia's most dynamic cities. All of this and more is made possible with Eastern & Oriental Express, an esteemed and opulent train journey to the exotic East, connecting ancient wonders and booming metropolitan cities. Twenty-five years ago, American businessman James B. Sherwood envisioned a way of traveling luxuriously through some of Southeast Asia's most enticing regions. Sherwood purchased several carriages of the Silver Star train built by Nippon Sharyo and Hitachi in Japan. He then had them remodeled in Singapore with the intention of mirroring the essence of classic Indochina. Since 1993, this inimitable experience has been gaining popularity for those who like to travel lavishly. This article is about the different available journeys on the Eastern & Oriental Express, the accommodation options, and some important tips for travelers. Hopping aboard the Eastern & Oriental Express is like teleporting yourself back to a simpler time, yet with ample opportunities for pampering and first-class amenities. A cream and green exterior is accompanied by polished wood-paneled corridors and silken furnishings, all with a classic Asian flare. While dining on the Eastern & Oriental Express, expect to feel like royalty, feasting over white-linen coated tables in ornamental dining cars with sparkling crystal and silverware. The train's most popular feature, the Bar Car, exemplifies a speakeasy atmosphere with soothing jazz music played throughout the evening, accompanied by stewards serving champagne, cocktails and wine. At the end of the night, cabins will be transformed into cozy sleeping rooms. Further amenities aboard the train include en suites with showers and toilets, air conditioning, a 220 voltage system, luxury toiletries, hairdryers, and 24-hour onboard service and entertainment. A premium space with extra touches of luxury, the Presidential Suite includes its own Wi-Fi, recliner seats, the ability to control your own music, and drinks from the complimentary minibar. The State Suite is light and airy with windows facing outwards, designed specifically for you to lose yourself in the passing picturesque landscapes of the enigmatic East. The Pullman Suite boasts plush seating with a vintage charm and double-decker beds accompanied by fresh crisp linens. 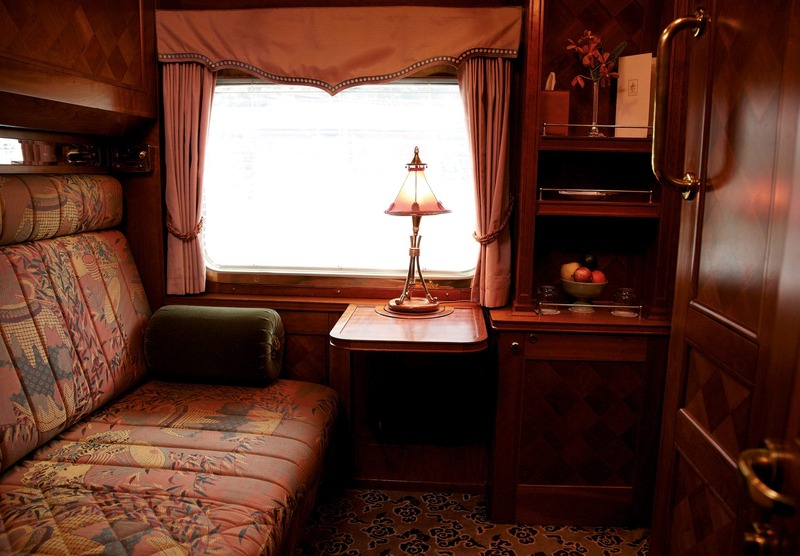 An ideal option for the solo traveler, the Pullman Single offers an intimate retreat with luxury flourishes, ornate details, and elegant seating that converts into a single bed. For more information on Eastern and Oriental Express' accommodations options, click here. A suite on the Eastern & Oriental Express. Source. The Eastern & Oriental Express offers several different trip options throughout the year. All journeys include a dedicated 24-hour steward service, a daily continental breakfast, three-course lunch, four-course dinner, and various guided tours. This three-day journey starts in Bangkok, then ventures to Kanchanaburi for your choice between guided visits to the River Kwai Bridge or the Thai-Burma Railway Museum. The Tracks to Unseen Thailand tour includes biking through rice paddies and a visit to a local farm. The Local Flavors tour combines a raft cruise with a cooking class. You will be woken with breakfast in bed on the second day of this adventure, making your way to Malaysia with visits to Kuala Kangsar and Labu Kubong. The third and final day of the tour ends in Singapore, where travelers can continue onward with their own personal travel arrangements. Visit the famed Best of Highlands tea plantation at the Cameron Highlands in Malaysia, or discover the jungle's flora and fauna on the Jim Thompson Trail during this seven-day Fables of the Peninsula journey. Travelers can play hide and seek with Penang's renowned street art by Lithuanian artist Ernest Zacharevic on the fifth day of the tour. On day six, visitors get a feel for what island life is like in Southeast Asia. Stopping at Koh Chang in Thailand, this journey offers an opportunity to explore the island's rugged cliffs, home to thousands of bird colonies. Embark on a culinary voyage like no other with acclaimed chef, author, and television personality Ian Kittichai. Filled with gourmet adventures, this journey will leave you craving more. Tantalizing and seasonal Thai cuisine is Chef Kittichai's specialty. Guests will begin their trip with Ian's take on a British afternoon tea -- but with a Thai twist. On the second night of this gastronomical escapade, guests are welcomed to an outstanding three-course meal prepared exclusively by Chef Kittichai. Click here for a full list of journeys offered by Eastern & Oriental Express, along with more detailed information, including prices and dates. There are several things to consider before taking a luxurious train ride with Eastern & Oriental Express. Here's a detailed list of important travelers' tips to read through before embarking on this incomparable adventure. Happy Trails!